Vaseashta, A., Susmann, P., Braman, E.
Cyberspace is a ubiquitous realm interconnecting every aspect of modern society, enabled by broadband networks and wireless signals around us, existing within local area networks in our schools, hospitals and businesses, and within the massive grids that power most countries. Securing cyberspace to ensure the continuation of growing economies and to protect a nation’s way of life is a major concern for governments around the globe. 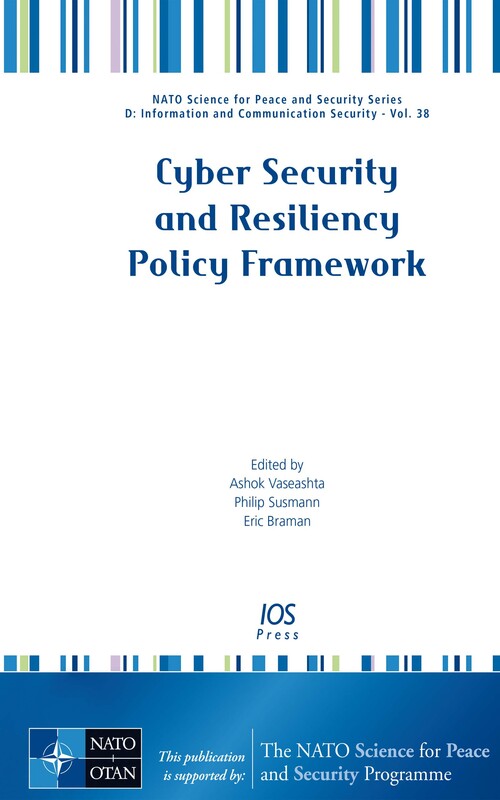 This book contains papers presented at the NATO Advanced Research Workshop (ARW) entitled Best Practices and Innovative Approaches to Develop Cyber Security and Resiliency Policy Framework, held in Ohrid, the Former Yugoslav Republic of Macedonia (FYROM), in June 2013. The workshop aimed to develop a governing policy framework for nation states to enhance the cyber security of critical infrastructure. The 12 papers included herein cover a wide range of topics from web security and end-user training, to effective implementation of national cyber security policies and defensive countermeasures. The book will be of interest to cyber security professionals, practitioners, policy-makers, and to all those for whom cyber security is a critical and an important aspect of their work.